SAAHE Central Branch presented a symposium on ethics and new learning on 12 and 13 September 2014 in Kine 8, Francois Retief building, UFS. The symposium was officially opened by Prof G.J. van Zyl (National Chairman SAAHE). The first speaker, Prof Theuns Verschoor (Faculty of Law, UFS) discussed social media in practice. The dangers regarding patient confidentiality and blog discussions concerning specific conditions or cases were emphasised. The speaker compared social media to the town square of a small town, warning that gossip can spread like wildfire. He warned that the professional life of professionals and their personal lives should be separated. If professionals make use of social media to give information, or to make contact with patients, all legal and ethical issues should be adhered to, for instance no personal information of patients, conditions or diseases should be disclosed. Patients should not be befriended on social media and informal patient discussions should be avoided. Group discussions of different cases produced lively discussions amongst the attendees. Prof Willem Kruger, chairman of the Ethics Committee, Faculty of Health Sciences, UFS presented a lecture on the ethical dilemmas in student research. He discussed the review structure and processes to obtain ethics approval and the problems experienced by the Ethics Committee. He emphasised that the role of the Ethics Committee (according to the Health Act section 73) is to review the protocol, to promote health, disease prevention or cure, and they only grant approval if the protocol is ethically sound. The administration staff members in the office make sure that the documentation handed in is complete. The protocol is then sent to two reviewers before the committee meeting. They do not have any influence on each other. Comments or questions from the reviewers are sent to the researcher via the Ethics Committee office. Sometimes a third reviewer can be called in to give an opinion. At the monthly Ethics Committee meeting, the proposals are presented to all members and additional questions could be asked. If necessary they could ask the researcher to come and explain certain aspects of the study. The decisions reached by the committee are with consensus and voting (majority). Additional/unanswered comments/questions are sent via the Ethics Committee office to the researcher and the researcher has to reply before the next Ethics Committee meeting. There are complaint procedures in place if necessary. Prof Kruger emphasised that the aim of the committee is to ensure ethically sound research, protection of both participants and researchers. The guiding principles for the committee are to look at the relevance of a study, if the study is scientific in a South African context and whether it is advancing the body of knowledge. They also have to look at the adequacy of research methods, the insight of the student and the suitability of the supervisor. The committee also looks at the suitability of the study population to support the study, e.g. vulnerable groups, the number of participants and adequate demographic information. The committee has the obligation to look at the protection of participants by means of right to privacy/confidentiality, recruitment procedures by providing adequate written information to make a decision and allowing for sufficient time for participant to make a decision. Other issues they look at include publication and authorship agreements, the adequacy of statistical methods, signed approval from authorities and the location/organisation where the research will be conducted. On the Saturday, the emphasis was put on the ethical aspects of simulation education and training. The four speakers addressed different aspects of simulation ethics, namely the patient, the student, child standardised patients and the issues around death in a scenario. The Saturday’s sessions are summarised in Figure 1. Error reduction in medicine is now a clinical imperative for all physicians. Patients are more educated and rightly demand the highest clinical competence of all their physicians. Recent technological advances and reduction in the cost of computer processor power, memory technologies and video processing now permit the accurate reproduction of simulated clinical events with sufficient fidelity to reproduce physiologically accurate clinical scenarios. SBME provides risk-free learning that can encompass many complex elements of critical and rare clinical scenarios. There are global reasons to use clinical simulation, for instance to improve patient safety, emergency management of conditions, for already qualified practitioners to stay up-to-date and for training in the management of rare conditions. There are also specific medical education challenges in South Africa, such as the HIV/TB epidemic, the changed case mix in training institutions, the static or decreasing teaching platform and escalating student numbers. The presenter made use of case studies to illustrate the principles of patient safety and how clinical simulation could improve patient safety through skills training, group training in teams and to improve clinical attributes such as collaboration, communication, professionalism etc. In the words of Amatai Ziv: “…patients are to be protected whenever possible and they are not commodities to be used as conveniences of training”. Ms Anna-Marie Welman from the School of Nursing focussed on the students undergoing simulation training. The psychological safety for students is to learn in an environment that is safe, free from harm, risk, danger and difficulty. A safe learning environment is an environment where students should not be ridiculed or embarrassed by their mistakes. They should function without debilitating anxiety and learn from mistakes without being afraid to fail. Clinical simulation and the simulated environment should be a place to ask questions and learn through feedback. 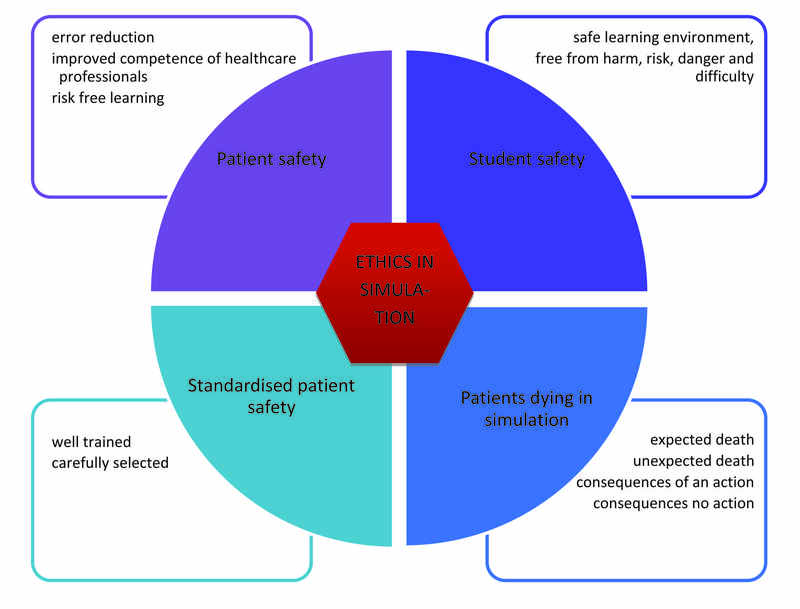 Simulation anxiety can play a role in negative experiences of simulation and measures to counteract the anxiety should be in place, for instance by pre-briefing, introduction of clinical simulation early in the curriculum and mentoring by senior students. Quiet atmosphere, away from simulator bed. Students should be able to watch video recording. Circle seating – lecturer becomes peer and facilitator. Without ridicule from lecturers or peers. As soon as possible after simulation occurred. Time allocation: death and dying issues require more time. Lecturers who were present in simulation to lead the debriefing. Presence of two lecturers is advised. Debrief simulation group separate from observers to ensure safety and protection against criticism. Ms Juanita Swanepoel, Clinical Skills Unit, School of Allied Health Sciences, discussed the pragmatic and ethical considerations in working with children as simulated patients (SP). By using children as simulated patients there are benefits for all stakeholders, e.g. a safe, controlled environment is created for the educators and students, students acquire the skill and competence to work with children, and fair, equal assessment is created through standardisation. For the child SP in a simulation situation, harm can be limited if the child SP is well trained and carefully selected. Greater control and predictability minimise risk through role training, debriefing, explicit instructions, selected skills and careful control of the duration and frequency of simulation sessions. Child SPs are being used in health profession training – especially in as far as it concerns standardised assessment. It was stressed that children from all ages can be used as SPs. Older children are able to portray a wide variety of roles in convincing manners while younger children can still be used to perform actions independent of role play or to act as they always would. The type of action required from the student during simulation can include anything from interviewing and observation, conducting physical examinations or administering intervention. Simulation with child SPs is a valid and reliable assessment method. Ethics of Care and Ethical Life Attitude (How to do as much good as we can?). Mr Rod Campbell from the Central University of Technology presented an interesting and relevant topic. The title of his presentation was: “Patients dying in simulation: an ethical dilemma or an imperative?” The reality of death and patients dying cannot be ignored, especially in the training of Emergency Medicine students who encounter this on a regular basis during their training. In his presentation he mentioned that there could be different scenarios, namely expected death, unexpected death consequences of an action, or consequences of no action. When death is part of a scenario, it should always be well planned, it should prepare students for real life experiences and it should be realised that death follows normal tragedy. When death is part of a scenario, debriefing and degriefing is useful training tools and should always form part of the training sessions. Death of the simulator should always be part of the learning outcome and never used as punishment of students. The Ethics and New Learning symposium of the Central branch was received well with good attendance and positive feedback from attendees. Aspects addressed were relevant, topical and useful.